American readers may not have crossed paths with British author William Brodrick before this -- but Overlook Press is bringing out the fourth in his Father Anselm series at the end of this month (March 28), with more of the series to come. And that's a great treat for those of us who cut our mystery teeth on G. K. Chesterton's Father Brown stories -- as well as for readers intrigued by the frictions of Europe's small nations and large conflicts. 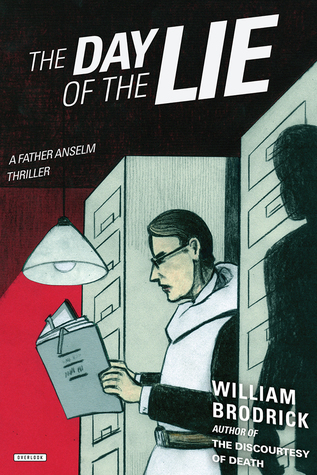 THE DAY OF THE LIE takes Father Anselm out of his monastic retreat, to assist an old friend in danger -- spiritual more than physical, it seems. At least, Father Anselm's Prior already seems to know more than Anselm about John Fielding's troubles and guilt. And for much of the book, that's the very human strand that will keep Anselm pursuing the truths of a dangerous time in Eastern Europe, and the path of a woman named Roza, who'd been a revolutionary all her life. In fact, it's Roza's reappearance in John Fielding's life that pulls the old friend to Anselm's door, with a desperate request: "I need a lawyer." "I want you to be vigilant, Anselm," began the Prior, watching where he was putting his feet. Branches had fallen during the recent bout of high winds. ... "I don't wish to offend you, but regardless of your many years in the criminal courts, you have no experience of the place to which you are going and the dangers it holds. Nor is it a prison cell where you're protected by that strange respect which even the most violent men hold for representatives of the law ... You'll be entering the world of Otto Brack, this frightening man who learned how to bring about evil by exploiting someone who is good, laying -- in part -- the evil at their door. I have never come across that before. You must take special precautions." Anselm was unnerved by the Prior's declamatory tone. It was reserved for funerals. He was surprised, too, but the warning. The plan was to fly to Warsaw, open a file, have a quick read, eat some pickled cucumber, drink himself senseless, and then come home. The chances of mishap were remote. He said so. Of course, Anselm's error of misjudging the danger comes from a lack of information, and it seems very unfair that the Prior won't or can't share what's already been exposed by John Fielding. But there it is, and soon Father Anselm is on his way to a land drenched in the tragedies of centuries of violence and injustice. And yes, evil. With strange roots, though. Brodrick's writing has won much acclaim, especially for the first in this series, The Sixth Lamentation. He has his own experience as both an Augustinian friar-in-training and barrister to draw on. And he has a complex and intriguing tale to tell, saturated with violence and regrets. Patience is required for THE DAY OF THE LIE, though, as some of the narrative is jerky, and references to characters sometimes aren't clear. Jumps in time and place add to the dislocation. Still, the compelling story makes it worth putting up with the book's flawed movement, and the pace is rapid and intense, with characters worth caring about. I'll be looking for the others in the series -- and hope Overlook will quickly make them available. Ready for a "cozy" mystery that keeps things stirred up but will send you to the kitchen, instead of into bad dreams? 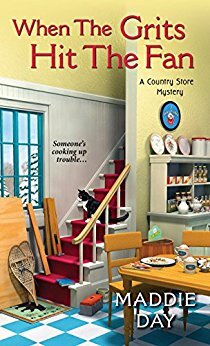 Maddie Day's "Country Store Mystery" series is prepped just right, off the breakfast griddle and into the sort of amateur investigation that rings true to small-town life. In the third book in the series, WHEN THE GRITS HIT THE FAN (release date March 28), restaurant owner Robbie Jordan ought to have a peaceful winter season for her mostly breakfasts shop, Pans 'N Pancakes. It's not tourist season, and the nearby Indiana University campus doesn't directly affect her, but she's just started hosting the Sociology Department dinner gatherings, which ought to help with cash flow. In classic cozy fashion, the book opens with a gathering where it's clear that a lot of people have reason to dislike Professor Charles Stilton, whose specialty appears to be mean comments -- when he's not baldly stealing the work of his graduate student or emotionally abusing his wife and son. So to readers of the genre, it's no surprise that Robbie Jordan and her friend Lou, the graduate student whose work was stolen, find Stilton dead the next morning. But author Maddie Day (one of the pen names for New England author Edith Maxwell, who has some Indiana roots) knows how to liven the story with unusual twists -- from local family secrets to revelations in the restaurant's old upstairs rooms to the kinds of stress that thrive in academia. I pulled my scarf closer around my neck and turned on the bench to face Georgia. "I keep thinking about the murder." She winced and averted her eyes. "I wanted to ask if you knew about any other people, locals, who had a beef with Charles. I can't picture any of the so-called persons of interest actually killing him -- my friend Lou, her department chair Zen Brown, Maude, Ron. None of those make any sense. And definitely not you." "You know, Charles was very charming in public. From a distance. I think a lot of folks liked him thought he was smart and a nice guy, but if you had any close dealings with him, whoa. Watch out. He'd stab you in the back." "I've seen him in action." She glanced at me. "Not a pretty picture." The pace is smart, chatty, and steady, and whips into high tension in the last few chapters, as Robbie's persistent defense of her friends plus her ability to put the facts together take her into the sights of the killer. A good read, with plenty of rural Indiana color and lots of food and wine chatter -- and of course, a handful of recipes at the end, including one for Grits with Cheese that I just might have to try soon. I'm posting this review a bit early to make room for readers who like to preorder, but also because it's a busy season for the author. She has three very active "amateur sleuth" mysteries, and her next book, Called for Justice (a Quaker series), comes out in a couple of weeks under the Edith Maxwell author name. Great fun to follow all her books at once; for lists and news, check out her website here. 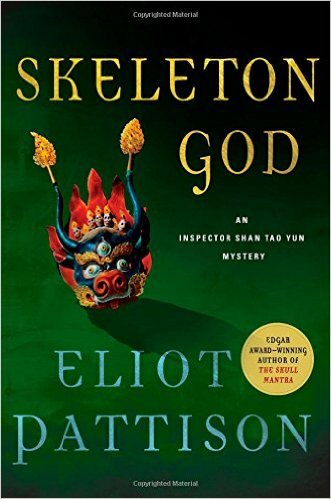 Eliot Pattison's first book in the Inspector Shan series, Skull Mantra, earned him an Edgar Award. The series has consistently grown deeper and stronger each year, and now the ninth book SKELETON GOD, pits Shan against the Chinese military occupation of Tibet with tremendous risks: that he might lose his hard-won visits with his imprisoned son Ko, and that he might lose his life -- for the sake of the people and heritage of this rough land. Shan's situation as the book opens seems mildly perilous but better than many he's already navigated: He wears the hated Chinese uniform of a local constable in the rural town of Yangkar, as part of a deal he's cut with the powerful Colonel Tan, his nemesis from preceding years. Although the Tibetans who've returned to live in the re-manufactured town don't trust him (prejudice works both ways), he at least has some professional standing, and most importantly, Ko is to visit him without shackles, for a few days every three months. When murders and devastation infect his town and he can't stop the killings and destruction, Shan fears he'll never see Ko after all. But just when it looks like, against the odds, he'll have his son's companionship, Colonel Tan bulldozes into the town, angry at the chaos, grimly admitting to Shan, " I gave you the quietest post in my county, so remote no one would ever hear your howls of desperation." Shan's passion for the old Tibetans and his embrace of their spiritual life and rituals mean he can't walk away (and if he did, how would he see Ko?). He faces Colonel Tan as both of them realize they have a joint enemy in the powerful "heroic" veteran General Lau, who despises them. "Karma," Shan said at last. "It's like divine justice. That's the only kind that will ever reach General Lau." Tan cocked his head. "Surely Lau is not implicated. Don't even bother to suggest it. Lau would never kill soldiers. He just sees some kind of opportunity in this. He's bored in retirement. He found a diversion." Shan looked longingly out the window toward the café where his son sat. He wanted so to be there with him, to take him home, to walk with him on a quiet mountain path, to rejoice with him in his temporary freedom and begin the list of activities he had planned for his visit. He glanced at his watch. "Give me a couple hours of your time," he said instead. A pair of misplaced Americans, hidden histories of the town's past and the violence of the Chinese takeover, revelations of what Shan himself needs to learn -- all these are in play as, layer by layer, the careful investigator peels back the secrets around him and earns the trust of some of his neighbors ... and the dangerous enmity of others. Is there a treasure hidden on the Ghost Plain nearby? What remnants of the ancient Tibetan medical school may linger in the people around him? Can Colonel Tan still exert enough power to protect Shan against other Chinese military manipulations? This is a highly satisfying book, where the small links and clues accumulate and are at last organized into a twist of plot that surprises even the investigator. The book's resolution is emotionally fitting as well. Consider what it may mean that a yak has been ransomed from death, and a raven persists in flying over the mountain that guards the secrets of the past. As the author says in his end note, "The shadow that settled over Tibet decades ago sometimes makes writing novels set in that land feel like searching for jewels in a dim cave. ... The shadow may exist, but dig a little deeper and brilliance can still shine through." I swore I'd never read those crazy books that mingled crime fiction and the paranormal -- until I picked up one of John Connolly's and realized the hauntings and lines of evil portrayed were really good metaphors for the kinds of crime that even rural areas find poisoning the well of life from time to time. And then I more or less tripped over Tarn Richardson's first book in his "The Darkest Hand Trilogy," The Damned. As I wrote in my review of The Damned last year, Richardson's choice to use an enduring Catholic Inquisition, warrior priests, and accursed werewolves turned out to be an apt way to portray the blood-soaked years that made up World War I. 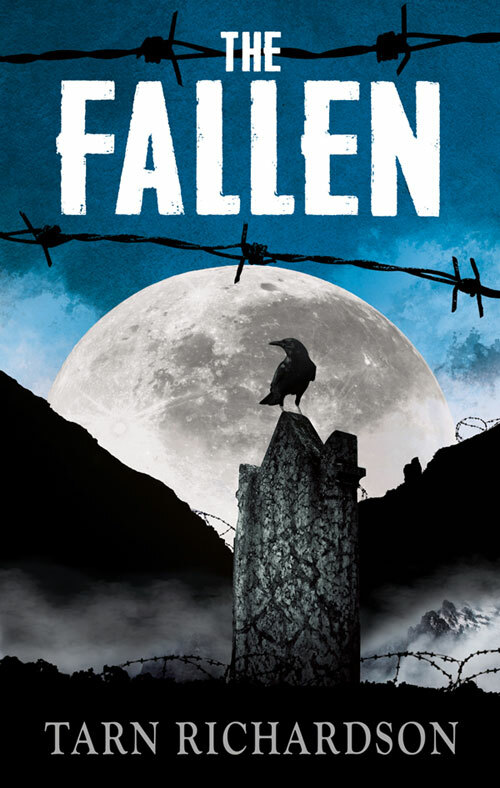 Now the second book is available: THE FALLEN. Crusading inquisitor Poldek Tacit suffers the most horrific tortures of the Inquisition as the book opens -- while the dark forces he once battled are in motion from within the heart of the Vatican, laboring to be sure the killing grounds are truly saturated with the blood of Europe's finest generation. As Tacit reflects on the secrets and maneuvers that resulted in his imprisonment -- for preventing carnage at a "Mass of Peace" in Notre Dame attended by international peacemakers -- he's well aware that if he'd been true to his depressed, angry, despairing self, and less susceptible to a nun's kindness and integrity, he might not be in this plight. In a world fuelled by hate, at the end it was a love Tacit thought he never could feel again, this time for Isabella, which brought salvation for him and save Isabella. Making sure she was out of harm's way, Tacit had bounded alone into the Mass for Peace and blasted Cardinal Monteira from the pulpit just moments before he had slipped the stinking wolf's pelt over his head and transformed into a bloodthirsty werewolf. Tacit wondered if he could have done anything differently to save himself, to avoid arrest. ... No, he would have changed nothing. "Stop!" she said. "Stop! ... You're telling me great swathes of people have sided with the Devil? That it originates from within the Vatican? That they are attempting to see his return to the world? ... I will not believe it for a moment!" "And that is why they are allowed to grow, fester like a disease in a wound. For long we have investigated. They are preparing his domain. But he will only return when the world is truly ready, and his lieutenants are in place ... they must be stopped." Fear not, the Poldek Tacit/Isabella romance never has a chance to heat up the way that a certain vampire series did a decade ago. THE FALLEN swiftly turns into a series of battles on the Italian front of the First World War ("the war to end all wars") that author Tarn Richardson notes (at the book's end) have been seemingly forgotten -- yet were held in extreme conditions and cost the lives of almost half a million men. The abrupt, short chapters of the book -- there are more than a hundred -- fit this battle-by-battle crushing force of history well. And Richardson's use of his alternate history makes more sense out of the insistent killings than any dry narrative could. Tacit's determination to stop the forces of evil swiftly leads to his own position as a piece to sacrifice in the game. Can he make the sacrifice effective enough, worth the dying? When I finally came up for air after reading this, I felt like I understood the cost of that war much better. Horror is sometimes the truth of those millions of deaths, isn't it? I'm looking forward to next year's finale. Meanwhile, I have a satisfyingly different point of view from which to look at some other powerful World War I narratives again, from those of Charles Todd's guilt-haunted mysteries to the heartbreaking clarity of Pat Barker's Regeneration Trilogy. And, of course, some nonfiction on the Great War -- even if that's not as strong a historical narrative as Richardson's own. From Overlook Press, publisher once again of the uncannily insightful. Randall Silvis's books have rolled along since 1984. Not all of them are crime fiction, but enough of them are so that I'm bewildered that I haven't ready any of his earlier titles. 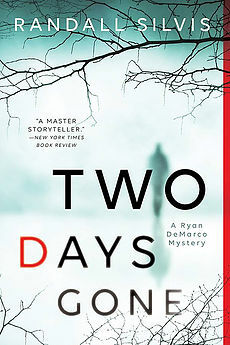 I'll be making up for that now -- because TWO DAYS GONE, one of three books of his coming out this year (! ), is a marvelous read. In some ways it's the perfect book for anyone who loves to speculate on the author behind the story. Police Sergeant Ryan DeMarco has his own deep sorrows, but he's always thought local resident Thomas Huston -- a college professor in their Pennsylvania town -- has the perfect life. Wife and children who thrive on Huston's love, a well-respected teaching job with mostly wonderful students, colleagues who ... again, mostly ... respect him. And the next book already underway, no issues with writer's block at all. DeMarco needs Huston's warm friendship, and he's deeply curious about how the novelist works. So the last thing he expects is Huston's family to be slaughtered. Huston himself is missing and is the presumed murderer. What happened? What could make this man snap? And if Huston, with so much going right, could descend into criminal madness, could DeMarco himself be at risk? Softly he said, "Did he know how you felt about him?" A tiny movement flitted at the corner of Briessen's eye, a twitch, a wince. Then he shrugged. "It was never expressed, never talked about. But I'm sure he knew." DeMarco waited for the rest of it. "The thing about Tom is, right from the start, he treated me like an equal. I mean I might never publish a single word. But he respected my ... intent, you know? He respected the dream. More than anything else, that's what made him so special to me." De Marco allowed half a minute to pass in silence. "You have any idea where he might be, Nathan?" "I wish like h*ll I did. Imagine what he must be going through right now." "I've been doing my best to image just that. Where would he go? What would he do?" "I think he's looking for the killer." And just like that, DeMarco knows he'd not alone in wanting desperately to believe that Thomas Huston didn't slaughter his wife and children. But where is he? And why won't he come in to the police, if there's a chance he's innocent after all? The more DeMarco investigates, the more he realizes that Huston's authorial research put him at risk, involving young prostitutes and their pimps. But the pieces won't fit with the crime. Tender exploration of how stories emerge for writers takes place, and the plot gently twists, then twists again, until the final events in TWO DAYS LOST are stunning -- but totally fitting. A highly recommended book. Author material at the end gives added insight to Silvis's own authorial dreams -- making the book even more of a gem. Published by Sourcebooks Landmark, and as I mentioned at the start, I'll be looking for other Silvis books to enjoy later. David Downing's World War II series set in Berlin, Germany, starting with Zoo Station, turned the cruelties and disasters of wartime Germany into a panoramic backdrop for a series of espionage adventures and some serious grown-up romance. After those six books, Downing moved to World War I and a set of very different espionage novels, featuring brash British spy Jack McColl and his star-crossed lover, an Irish-American journalist, Caitlin Hanley. The couple's extreme risks in Jack of Spies and One Man's Flag pitted them politically against each other: Jack working for the British government, and Caitlin taking the side of the Irish rebels, in spite of an effort at journalistic balance. In the process, Caitlin's brother died, with Jack mortally involved -- and although finally sharing details brings some relief from guilt and blame, there's still doubt about how well Caitlin and Jack can handle being a couple, considering their jobs and loyalties. So we open in 1917 in LENIN'S ROLLER COASTER, with a pair of workers' revolutions in Russia while the rest of Europe is tugging the "Reds" into the Great War. Caitlin wants to reconnect with her Bolshevik friends, to build stories of the massive changes in human history taking place; Jack's assigned to blowing up bridges and anything else that will keep the Germans from getting the arms and other supplies they need to win the war against England and France. Downing's Berlin (World War II) series unfolded a very different side of that war, the "home front" in what was once one of Europe's most elegant and civilized cities -- but this new World War I series, partly because it's further back in time but also because American readers, at least, know fewer details, challenges Downing to create fully fleshed settings and motives. Motive, on the other hand, is emphatically not a problem for the people pushing Jack and Caitlin around: They know what they want, and they'll kill readily to move their causes forward. Even Caitlin's closest, kindest friends turn out to have a talent for violence, without regrets. 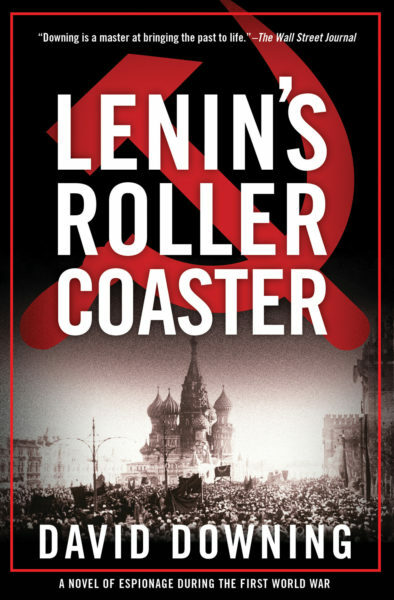 The weight of so much detail to introduce moves LENIN'S ROLLER COASTER off the pace of traditional espionage or crime fiction, though. Pages upon pages pile up with background and explanations. 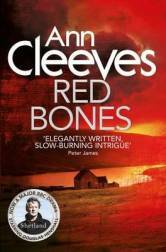 Interior comments from the characters aren't sufficient to whip the pace. A sample of the text: "If the Bolshevik experiment ended in failure, Caitlin thought the failure should be their own. If Lenin and the party went down to defeat, it should be at the hands of the Russian people, not a cabal of foreign interests in league with past oppressors." When the two adventurers finally cross paths in Moscow, the friction between them adds striking danger to each one's pursuits. But it takes three-fourths of the book to reach that part -- a long journey made lively at the halfway point by Jack's unexpected fostering of an orphan, but otherwise challenging for readers who seek a rapid pace and costly decisions made under fire. Oddly, the book seems to have taken on some of the Russian literary maneuvers and density. This means that if you like Russian espionage, an unusual face of World War I (the Great War, the war to end all wars), and insight into the factions that clashed after the Russian Revolution, this book's meant for you. Think Boris Akunin, for instance -- plan to spend time with this one. I'm a committed Downing fan, for the meticulous historic details and cultural insight, as well as the face of fiction. 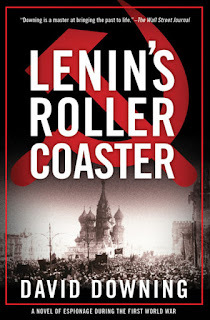 And I was glad to take my time in reading LENIN'S ROLLER COASTER. But I have relatively few readers I'll recommend this one to -- because it's so far off the genre's usual conventions. Downing is an amazing author; I'm hoping there are enough "unconventional" readers out there to keep this series going, and to satisfy the hunger to see Jack and Caitlin somehow reconnect once the shooting is over. All from Soho Crime, of course.